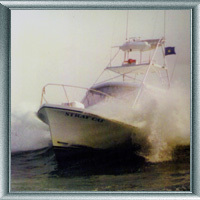 The Stray Cat is a custom built fiberglass 31 foot sportfisherman. Captain Ron designed the boat for optimum use in fishing with a spacious fighting cockpit. The forward raised helm deck contains 2 settees for comfortable seating in any weather. A fully enclosed stand up head and galley are located below decks. The Cat is equipped with state of the art navigation and safety electronics, life raft, and EPIRB. We carry a full complement of fishing tackle to cover all aspects of the sport from big game trolling offshore for marlin and tuna to flyrodding for stripers, blues, and small tuna inshore. USCG licensed since 1974, Captain Ron Murphy has conducted seminars for the Massachusetts Maritime Academy, the Massachusetts Striped Bass Association, and many angler clubs on fishing Cape Cod's waters. Ron has helped his customers to win a number of 1st place Massachusetts Governor's Cups as well as many tourney awards. 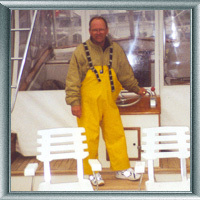 Over the years, Captain Ron and his fishing prowess have been featured in many leading industry magazines and books. When I started my business in 1978, I wanted to feature the excitement of catching big fish on spinning gear and flyrod. Now, after 30+ years, many of our customers return yearly to experience the thrill of light tackle angling for stripers, blues, bonito, and false albacore. All tackle is provided including custom flies and flyrods. Feel free to bring your own special outfit. Fishing the offshore rips puts your fly or plug within short casting distance from the Cape's biggest stripers and blues.